Beloved as it is, local food is kind of an attention hog. The Source Award winner for Forester is Local Wood Works, a group of seven organizations that came together over the course of the last decade to foster another kind of local. You can’t eat it, but sustainably harvested and milled wood? You can live in it, whether it’s the wood that frames a new home, makes up the bed you sleep in or holds the salad you eat. Local Wood Works developed out of a relationship that began in 2009. Kerchner reached out to the Maine Forest Service with the hope of collaborating on the conservation of Kennebec County’s forests. The forest service is all about helping state and private woodland owners manage their forests sustainably. The Kennebec Land Trust’s focus is on conserving forests. But as Kerchner, who has a masters degree in Ecology and Environmental Science from the University of Maine, would tell you, conservation doesn’t mean humans aren’t allowed to make use of sustainably harvested wood. 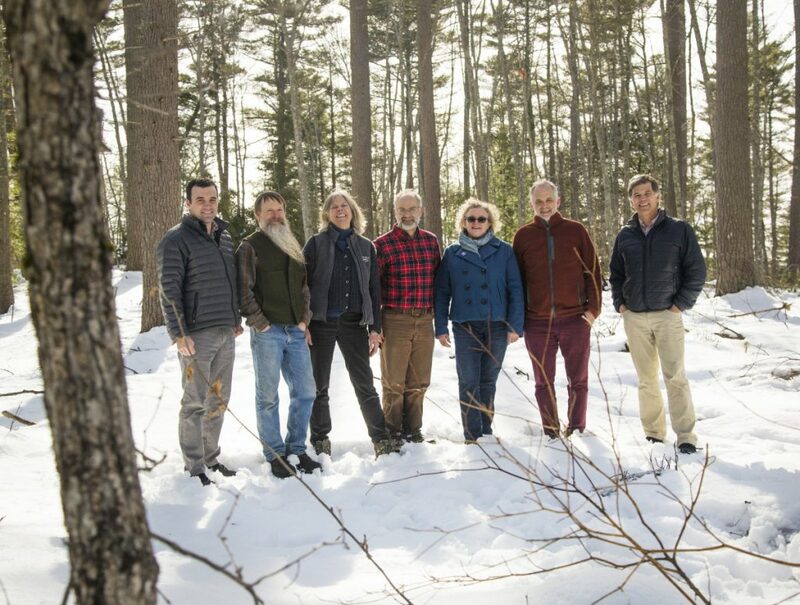 “From the beginning, as we articulated our mission it was to both support long-term conservation and advance forest-based wood economies,” Kerchner said. Working with a $15,000 (2012) grant from the Elmina B. Sewall Foundation, the conservation group and the forest service began expanding the partnership to include organizations from all over the state. It just made sense; according to 2016 figures, Maine’s total forest product sector employs 33,538 people, across every county. In terms of the gross state product, the forest product sector represents $5 out of every $100. In 2013, the land trust and forest service joined with three other partners, Coastal Enterprises, Maine Coast Heritage Trust and GrowSmart Maine to launch Local Wood Works. In 2015, two other partners joined in, the Nature Conservancy and the Northern Forest Center. Funding from the Sewall Foundation continued and in 2017 ramped up to $100,000. Jay Espy, the foundation’s executive director, said the Freeport-based philanthropic group considers support for the local economy part of “our DNA,” noting that Elmina B. Sewall regularly funds local foods efforts. “Even though it is challenging for a lot of reasons to think of Local Wood Works in the same vein as local foods – obviously the crop rotations are different – their concept of trying to build a local wood economy just had a lot of appeal,” Espy said. This week, the coalition of groups is unveiling a project that represents one of its long-term goals – connecting the consumer to local woods through a guide. Want to know where to buy a bed made from local wood? Looking for local hemlock for your deck? Tired of wondering whether the wood at the lumber store came from some woods up near Jackman or, Australia? The Local Wood Works Guide is intended to fill exactly that niche when it goes live (likely by this week, check localwoodworks.org), with information about sawmills, wood producers and sourcing. In addition to the online guide, a printed version, called the Maine Wood Guide, will be included in the Sunrise Guide’s Green & Healthy Maine Homes on March 26. For Morten Moesswilde, a district forester with the Maine Forest Service who has worked closely with Kerchner on the project for years, the connection back to the people who carefully select and harvest trees is essential. Local Wood Works will also play a role in a May 9 conference on Maine Wood and Sustainability, sponsored by passivhausMAINE. It is intended to strengthen ties between builders and the network of producers locally, to encourage use of local products. A big piece of the work this extensive group is trying to pull off is educational. Julia Tate, an architect at Portland’s Scott Simons Architects, said the experience of visiting places ranging from a forestry site in Millinocket to a shingle factory in Windham was “invaluable.” And so is the work Local Wood Works is doing.